It's hard to believe that it's less than two weeks till spring begins! It's is one of my favorite times of the year - I love when things start turning green, flowers poke their heads above ground, and buds appear on the trees! Today's inspiration celebrates one of the flowers we associate with spring - tulips! To make this card I started with a white card base and adhered a bright aqua piece of cardstock over top with my ATG gun. Layered over that is a smaller distressed piece of aqua paper stamped with a gingham background stamp from Impression Obsession in Versamark Watermark ink and embossed with stardust embossing powder. Two tiny pink blush pearls adorn the corners. Next I dry embossed a piece of vellum using the (Sizzix) doily embossing folder. I cut the doily in half and glued it to each side of my card. Around the center I tied a bow of twine in natural and pink. To make each tulip I cut three petals from water color paper (using the template below.) I inked the petals with worn lipstick distress ink (Tim Holtz) and misted them with my mini mister letting the colors run a bit before heat setting with my embossing gun. Once the petals were dry and glued together, I added a layer of ultra fine Valentine Coral glitter (Art Accentz) over the top. The leaves and stems were cut ( free-hand) and inked with mowed lawn distress ink. The tulips are popped up off the card using pop dots and a happy sentiment (from Momenta dies) completes my card. 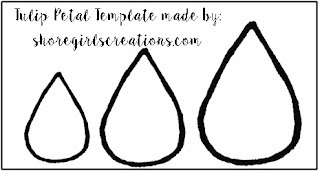 Here's a free template for the tulip petals in gradient sizes. To make a tulip: Trace and cut 3 petals from your preferred size and layer them as shown in the photo above. 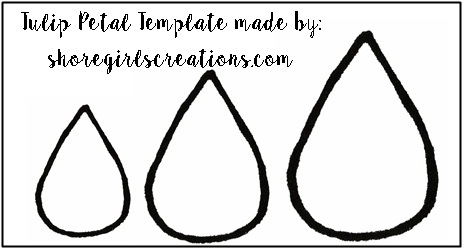 I shared this card on the Cropstop blog today and would love for you to hop over and link up your lovely projects (that use products from companies Cropstop carries in the store) to the CURRENT CHALLENGE! The vellum doilies look beautiful. Thanks for the tulip idea and the template. So pretty! I love those tulips...feels like spring! Oh Esther, I love, and I mean LOVE your card! It's simply beautiful. Such a pretty colour combo and a lovely layout! Thanks for sharing with us at Stamping Sensations. Beautiful card, lovely to see wet and dry embossing, thank you for joining us at Ooh-la-la. You are generous to share your tulip pattern. Your card is truly a work of art and love. All the extra touches of embossing, glitter, and hand-cutting a design... the doily adds a lovely touch too. Amazing! I hope spring does come soon... no sign yet here... snow, snow snow! A pretty card. Thanks for sharing at Stamping Sensations! Gorgeous tulips and beautiful doilies, lovely unique card! Beautiful card lovely addition of the parchment very effective. Striking & beautiful, Esther! You've made me want that doily embossing folder--so wonderful used with vellum!